The June 2007 issue of Dwell profiles the master urban plan of Sasaki Associates for the 2008 Beijing Olympics (image via Boston Sociey of Landscape Architects). Dennis Pieprz, a principal at Boston-based Sasaki, whose design was chosen as the winner during an international competition, told Dwell that “[t]he most important aspect of the urban planning of the Olympics is the legacy and what you have left over given the huge investment.” Such recognition is critical given that many cities (Montreal, Sydney, and probably Athens, for example) have struggled- financially and otherwise- as they’ve grappled with the enduring legacy of their respective Games. To that end, Sasaki’s design acknowledges the possibility that Beijing planners might confront an albatross of an urban district after the Games are complete. In an effort to avoid this unsavory possibility, the firm has integrated as much green space as possible into its master layout for the Olympic facilities, including over 1,700 acres of woods and wetlands, while also integrating its plan with the fabric of the rest of the city. Moreover, areas of land adjacent to the various sports venues include infrastructure and will be sold after the Games for private development. In this respect, Sasaki’s plan commits to sustainability and presents a thought-out approach to the legacy of the 2008 Games for Beijing. The sports facilities themselves are also demonstrably sustainable. 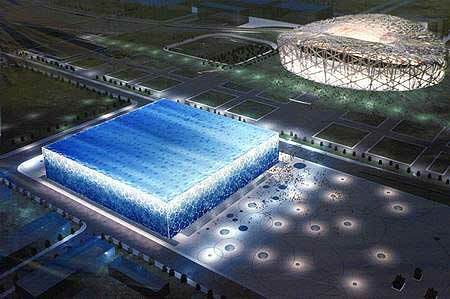 The National Aquatics Center, for example, designed by Australian architectural firm PTW Architects, will use solar panels to heat its pools and interior spaces while simultaneously recycling rainwater captured on the roof (image via China Daily, note the “Bird’s Nest” Olympic Stadium on the right). However, as Pieprz tells Dwell, “[g]reen isn’t really only about ecological matters, or things related to clean air or water. Green is about the social sustainability of urban design, and discovering leftover or brown fill sites that can be regenerated to become part of a living, vital urban environment.” Or, in other words, seeing the big picture and executing a cross-disciplinary design. Accordingly, integrated design- whether a base building system or a master plan for a complex, high profile urban district- remains the key to defining what it means to be green. As more firms across more disciplines are grasping this, the future of sustainable design is becoming increasingly bright. WWJJD: What Would Jane Jacobs Think Of Green Building In New York City Circa Now? Despite the apparent progress of the plan described, I have serious doubts as to China’s commitment to being earth friendly. In fact, just like the former Soviet Union during the 1980 Olympic Games, China will do anything and everything to try to impress the West with its “accomplishments”–from trying to control the actions of its citizens to controlling Mother Nature. I recently heard and read that the Chinese will blast the skies with chemicals to clear skies from any rain and perhaps try to control its increasing problems with smog. Plus, China is notorious for attracting businesses which do not want to be bothered with environmental regulations. My denunciation is not only aimed at China but the whole global-political structure which is stuck in the industrial-age notions of “progress.” I supposed, like many countries, China too is still cought in the mentality of an age where “progress” is defined by cars, rockets, satellites and tall infrastructures. Will we ever see a day where “progress” of a country is defined by the efforts to preserve and conserve environmental resources?